Is retail dead? This became the crux of the matter when I found myself invited to pitch in front of a leading retailer at the Advanced Technology Development Center (ATDC) at Georgia Tech. It was an exciting opportunity that was dulled when the name of the retailer was revealed. They are losing market share to Amazon, the big elephant in every conference room discussing supply chain topics. This retailer was on a downhill slide, shutting multiple store locations. There are two ways to look at this situation. I could figure that it was a waste of time doing this pitch. The other was to try to turn adversity into opportunity. You can guess which approach I chose. I felt betrayed by the fine print. It felt like a bad deal without the discount. That was the last time I shopped with that retailer, even though I walked by the store a hundred times. For me it was shoes, but I’m sure we could point to a similar example for just about any electronic gadget or gizmo around. My takeaway, though, was that all the talk of online killing retail may not be completely true. If retail is sick, it may be that they are not taking care of business. This adversity may be an opportunity to turn it around, come out bigger better and stronger. Besides, if retail is dead, why are Apple stores filled with people all the time? In fact, just this summer, the company opened its 101st retail location in Taiwan. Plus, there’s no argument that Apple stores are simply cool, with a modern club vibe full of glass. I’ve spent some nice evenings with my daughter checking out the newest devices, listening to music, trying out games and more. 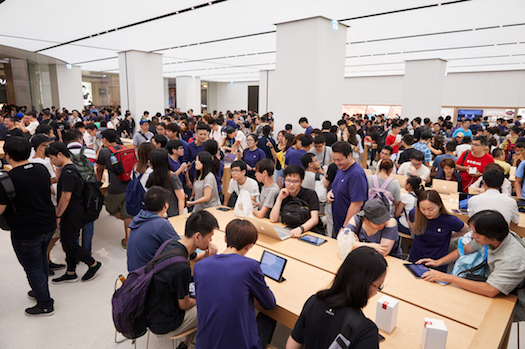 People used to window shop in malls, and now they are doing that same thing at the Apple store, since technology is such an important part of our lives. Our world is being transformed by technology, and retail isn’t any different. Technology is driving changes there as well. Retailers who hope on board this trend in smart ways, and incorporate technology into their stores, are the ones that are going to survive. Even Amazon is hopping on board, and opening futuristic stores that give customers a chance to get up close to technology and be engaged in cool ways. Retail: Selling products that solves consumers’ problems and lend a helping hand to solve their problem. Community: The brand engages customers, not just in the store but on social media, to build a community or tribe that makes the world a better place. Consider the Life is Good brand that has made a name and grown with this sort of effort. Consultation: Selling is changing. Consumers are well educated today and they know exactly what they want even before they walk into the store. They want help solving their problem. They want to find products and brands that deserve loyalty. Technology: Highly targeted and personalized to solve individual pain points/problems. This might be social media, email, relevant apps, or analytics. The retailers that don’t understand this are the ones that are going out of business.